Welcome to Monterey's Premier Paragliding school, nestled on the southwest coast of Monterey Bay between Big Sur and Santa Cruz. Monterey Sky Sports is a small school designed to give you personalized one on one flight instruction. Our instructors have been working in the flying industry for a decade and are here to give you a taste of flight that we hope will have you coming back soon for more. Paragliding and freeflight is a beautiful way to experience Monterey and the Pacific Ocean, while learning about a new and exciting sport. Come join us for a instructional tandem flight and taste what flying is all about. We also offer an introductory day class, which will give you an introduction to the basics of solo flight. If you already know you are passionate about learning to fly and paragliding, sign up for our novice training package! Our one day introductory lesson is a 4 to 6 hour training day on the sand dunes of Monterey Bay. Monterey Sky Sports provides all student paragliding equipment for lessons. This lesson gives you a brief glimpse into what it feels like to be a paraglider pilot and gets you out on the beach and in the elements. You day starts out with a brief meteorology lesson as we walk to the launch site together with the gear, you will learn how and why Monterey has such smooth consistent air to fly in the spring, summer, and fall months. Next we move on to a equipment introduction and brief demonstration. 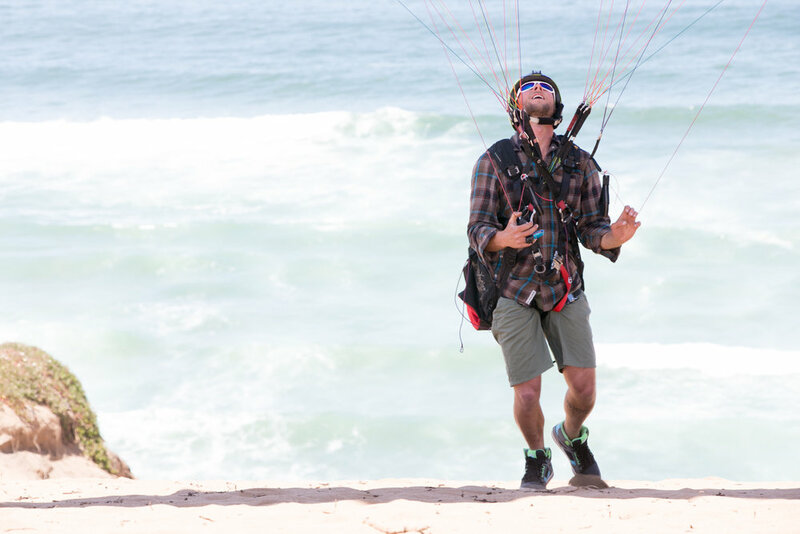 Using ground handling (kiting) to familiarize you with the aerodynamics and flight characteristics of the paraglider builds your confidence and understanding of how the glider flies. After some time practicing the launch sequence we will move on to some short flights to the beach. By launching, having a short flight, and safely landing you will get the feel for flight and then we slowly start adding skills and furthering your abilities over time. If after a few days of flying you decide to continue with Novice Paragliding Training, we apply all of your day class fees toward the novice package. Monterey summers are quite cool so bring layers! We recommend a light weight down jacket, and long sleeve shirt. Comfortable shoes or boots are best, remember we are walking around on the sand so high tops come in handy for helping keep piles of sand out of your shoes. Bring a hat, sunglasses, sunscreen, hydration, and a snack! Have you always dreamed of flight? Maybe you tried a tandem while on vacation and wondered what it would take to be come a certified paraglider pilot. Or you have been watching us fly around above you on the dunes of Monterey and this has ignited the passion inside you for flight... What ever the reason, come join us! Paragliding is a sport and recreation enjoyed my many world wide, and becoming a pilot is easier than you may imagine. Like anything it takes determination and drive, and the decision to become a certified paraglider pilot is the first step! Our program follows the national standard of paragliding instruction and introduction to flight. In the effort to produce competent, confident, and safe pilots we offer a full P1/P2 course which covers glider ground handling (kiting), ridge soaring, flight maneuvers, aerodynamics, meteorology, emergency procedures, reserve deployment, and the basics of thermal flying. We focus on building your confidence and skills by using ground handling (kiting) to familiarize you with the aerodynamics and flight characteristics of the paraglider. We start you off by fully going over the glider and gear and then moving to forward inflations, followed by some short flights to the beach. By launching, having a short flight, and safely landing you will get the feel for flight and then we slowly start adding skills and furthering your abilities over time. The length of the P2 course is variable and catered to your learning style and speed. Generally it takes about 10 days to two weeks to complete the skills, ground school, and flights required. The P2 course cost includes unlimited lesson days, it is a one payment cost to get you to your certification. We recommend that you start with a few day classes before committing to the entire program. This will get you started and put a taste in your mouth for flight and how our lessons go. The payment of any day classes you participate in will be credited towards the cost of the P2 course. Upon completion of the P2 course you will be considered a novice pilot and no longer need to be under the direct supervision of an instructor at sites that are rated at P2 level. It is recommended you start working towards your P3 (Intermediate pilot) which is simply an accumulation skills and hours. A P3 is required to fly at all launch sites in Marina State Park. We are out flying in Sand City most days and are always around to help and further you in your journey as a paraglider pilot. Monterey Sky Sports provides all the equipment you need to learn how to paraglide during your P1/P2 training program. During the course of your training we will talk about the different styles and certifications of paragliders to help you make an educated decision on the best glider and harness combination. The school has a wide variety of demo gliders and harnesses. Monterey Sky Sports will get you set up with a gear package that works best for your flying style, needs, and skill level. Check out our gear store to see the manufacturers that we work with and some of the gliders we recommend. Monterey Sky Sports will not refund a student who terminates the course after 5 lesson days. Before 5 lesson days are completed, should you decide paragliding is not for you, we will prorate the remainder of the course. Monterey Sky Sports reserves the right to modify, change, or delete any aspect of the training programs or fees at any time. Please note: The minimum age for a student is 18 years old.